The Undrowned Child by Michelle Louric was one of the delights of 2009 for me. Set in Venice of 1900 it pitted Teodora – the bright orphan child against the evil Bajamonte Tiepolo and his baddened magic. She was ably assisted by the Studious Son, Renzo and assorted Mermaids and all kinds of spectacular ghosts and creatures. The Mourning Emporium picks up the story some 18 months later and the evil Tiepolo is back, the giant enormous squids return too and it is all Teo’s fault because she could not bring herself to say the last line of the spell that would banish them forever. I have to say I pounced on the sequel with enthusiasm, but was a little taken aback by a great many chapters which effectively reminded us of the backstory to The Undrowned Child and only when Teo’s adopted parents are kidnapped and she is disguised as a boy by the mermaids that things begin to happen. Renzo is orphaned himself and sent by the dimwit of the Mayor to the orphan ship Scilla moored in the bay. Teo meanwhile is stranded on an iceberg with a magnifying glass melting it very fast so that she will drown and be eaten by Vampire Eels. She is saved by the birds and the seals and winds up on the Scilla (as a boy). To her delight Professor Marin is in charge and all would end well, save Professor Marin in shot and the super evil Englishwoman Miss Uish takes over with her henchman Malfeasance. They proceed to starve the orphans and prepare for more evil doings. Miss Uish is the most evil woman on earth and makes Teo and Renzo suffer greatly, starving them with disgusting foods, wiring the Cook’s mouth together as well. The violence is often extreme indeed. I have ploughed through this and enjoyed many moments on board the Scilla, the incredible meanness, the piratatical episodes as they make their way to London, the young heiress who is ‘kidnapped’ but seems to live in luxury aboard the ship and at night sings to leeches. But I wonder about Ms Louric’s readership and whether they too will stick with Teo and Renzo all the way to London and surmount the difficult language, the shift from Venice to cockney slang Dickensian London. The endless bits about Queen Victoria and the usurper Harold Hoskins who is league with Tiepolo and wants the throne when her majesty finally gives up the ghost. There is a host of new unlikely characters to meet and get to know and to be honest as rich and tense as it often is, it is all a bit overwhelming. The Undrowned Child was charming and beautiful and set in Venice. 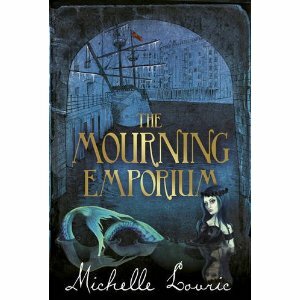 The Mourning Emporium with its cod Micawber entrails is hard going in the end and I feel many will simply give up once they get to London. Which is a pity.